Can manufacturing change India’s demographic destiny? Despite India’s substantial youth population, little concerted effort has been made by the government to ensure their accommodation in India’s labour market. Manufacturing could help partially address this, write Shubhranka Mondal and Pratibha Joshi. India currently has the world’s largest youth population. The working age group of 15-59 years forms an overwhelmingly large percentage at around 91% of the country’s population. The median age in the country is approximately 28 years. However, there has not been enough job creation to employ the youth transitioning out of education and moving in to the labour market. More than 31 million people in India are currently unemployed according to government estimates. Independent sources claim it to be even larger. It is therefore vital that the government abandons the self-complacency of what was dubbed by critics following remarks by Prime Minister Modi as a ‘pakora’ or start-up economy and consider the most appropriate and definitive policy changes to employ its burgeoning youth and adult population. So far the services led growth-model has not only provided limited job opportunities, but the poster children of the Indian service sectors – the IT and the BPO sectors, have now systematically started downsizing payrolls. The MSME (Micro, Small & Medium Enterprises) sector, typically employs less than five people and on average has limited scope for expansion as most tend to remain own-account enterprises. Currently only a fifth of Indians have salaried jobs, and half the workforce is in agriculture. Agriculture, while remaining the largest form of employment in India, is no longer the sector which provides the greatest value-add to India’s economy. Moreover, the youth of today are now looking towards an traditional economic transition model with greater job prospects in the cities. However, urban based occupations remain primarily of the informal sector, day labour variety. The prevalence of manual over mechanised labour in India remains high – coolies carry luggage in a railway station, construction workers carry bricks on their head or break stones with hands and hammers. Manual scavenging though abolished by law is still a common practice, and many middle class households still employ maids to perform domestic chores. Although there is no one-size-fits-all solution, historically formal manufacturing has had one of the highest potentials for mass job creation, as well as the potential to provide higher quality jobs with fairer pay to a large section of low skilled people. What India needs to do immediately in order to bring about manufacturing lead growth is not to give into the delusion that automation is soon going to take over much of the manual work. As of 2016, India used three robots for every ten thousand workers as against the world average of seventy-four. Republic of Korea tops the list of automation with 631 followed by Singapore, Germany and Japan at 488, 309 and 303 respectively. China, the global manufacturing giant is at sixty eighth. It will therefore take India a number of decades to reach any globally comparable automation level. 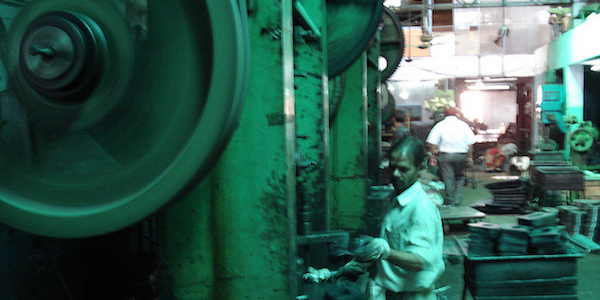 Mechanical punch presses in operation in a factory. Photo credit: ILO in Asia and Pacific, Flickr, CC BY-ND 2.0. The benefits of manufacturing and trade related growth are substantial. First, creating manufacturing jobs require little skill training. Empirical evidences show that it requires about six week’s training for fifth-grade educated adults to earn as much as Rs 15,000 in low skilled manufacturing like apparel, footwear or carpet industry. Second, manufacturing has a large multiplier effect. As per estimates, for each job created in manufacturing around sixteen more jobs are created in the related services sector like parlour, restaurants, schools, colleges, banking, finance, transportation, logistics, management etc. These are sectors where even medium and high skilled population of the country can find jobs. And third, manufacturing not only caters to domestic markets but given their tradable nature can expand and grow to cater to exports. With this in mind, it should not be a surprise that previously China and South Korea, and now Vietnam, Bangladesh and Ethiopia – recent high growth developing countries, have a flourishing manufacturing sector. Manufacturing jobs can provide an alternative to agriculture jobs. Indeed, due to the growing unsustainability of agricultural livelihoods, demand for non-farm jobs is clear from the eight million people who are signed up for MGNREGA (Mahatma Gandhi National Rural Employment Guarantee Act) jobs on any given day. In order to realise this change on ground, India’s latest industrial policy has to identify and prioritise key sectors of manufacturing, build proper industrial clusters and provide them market linkages to sell the finished goods both inside the country as well as abroad and across multiple value-chain systems. This also requires significant investment in infrastructure to mobilise movement of people and goods. However, it is important to acknowledge that the challenges to bring about this structural transformation will be considerable and we cannot ignore the fact that the global order and process for this transformation are not the same as they were decades ago, when for instance, manufacturing played a central role in China to lift 800 million people out of poverty in just three decades. Now that we have proposed to build industries we should make sure that we have solutions to the questions of adequate pay which allows upward mobility; good work conditions; the rise of ethical trade; international competition and trade barriers. India can reap gains of its demographic dividend if it ensures its human capital is well equipped with correct training and knowledge, and infrastructure is able to mobilise human, physical and financial capital. India therefore, needs to act before its youth bulge starts ageing, unless of course, it wants to remain in the crack of the epistemic developmental divide between the East and the West. Shubhranka Mondal is a researcher with IFMR LEAD and is working in the field of MSME, financial inclusion, trade, global value chain, labour and employment related issues. She tweets @ShubhrankaM. Pratibha Joshi is a researcher at IFMR LEAD, she has worked on RCTs related to worker productivity and business training for small business owners, as well as on topics related to human capital development. September 5th, 2018|Development, Economy, Featured, Technology|Comments Off on Can manufacturing change India’s demographic destiny?